Concocting art from food ain't new; Italian painter Giuseppe Arcimboldo was creating imaginary oil portraits out of foodstuffs more than 400 years ago. The latest twist, though, involves that newer wonder of the post-industrial age: photography. You might've seen the latest print-advertising efforts from the beef industry, featuring meatscapes of steak — steak as canyon walls, steak as oceanside cliffs, steak as mountaintops. Curly parsley, that 1950s steak garnish, gets put to good use here as trees, while coarse salt serves as crashing surf and sour cream becomes snow. 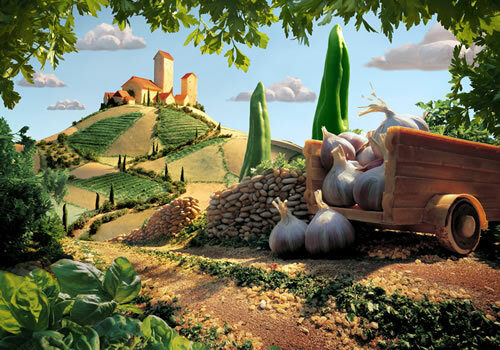 Best, though — and less beefy — are the foodscapes by British photographer Carl Warner. Waterfalls made from sugar, clouds from cauliflower, trees from broccoli, rocks from bread — the whole oeuvre is a bit like Disney on drugs. Kind of gives new meaning to the phrase "playing with your food."